Part science fair, part county fair and part something entirely new, Charlotte Mini Maker Faire is an all-ages gathering of crafters, educators, tinkerers, tech enthusiasts, hobbyists, engineers, science clubs, authors, artists, designers, students, performers and exhibitors. All of these Makers come together to showcase what they have made and to share what they have learned. In addition to launching Charlotte’s first Maker Faire, last month Discovery Place was invited to present at the National Maker Faire in Washington, DC to showcase how Discovery Place brings Make to the community through education. With Museum exhibits like Think It Up! and Innovate 301, a free community outreach initiative introducing residents to the Maker movement, the hope for launching Charlotte’s own Maker Faire is to bring Charlotte’s curious people together in order to continue growing this increasing community of local innovators. Discovery Place is now accepting applications for talented makers, designers, crafters and artists to exhibit their projects at the Charlotte Mini Maker Faire. Creative people of all kinds are encouraged to apply, from electronics prototyping and 3D printing to creative experimentation and artistry. For more information, visit cltmakerfaire.org<http://www.cltmakerfaire.org/> or join Charlotte’s online Maker community on Facebook,<https://www.facebook.com/CharlotteMiniMakerFaire> Google+<https://plus.google.com/113650687918723088019/posts>, or Twitter at @CLTMakerFaire. Check out all the fun at #CLTMakerFaire. The original Maker Faire event was held in San Mateo, CA and in 2015 celebrated its tenth annual show with some 1100+ makers and 145,000 people in attendance. World Maker Faire New York, the other flagship event, has grown in four years to 600+ makers and 80,000 attendees. Detroit, Kansas City, Atlanta, Milwaukee, Orlando, Pittsburgh, San Diego, Silver Spring, Ottawa, Lisbon, Paris, Rome, Berlin, Newcastle, Hannover, Oslo, Trondheim, Seoul, Singapore, Taipei, Tokyo, and Shenzhen are the home of larger-scale, “featured” Maker Faires. 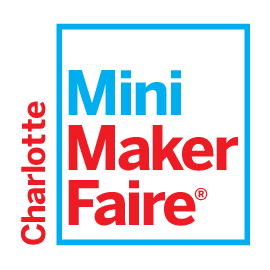 In addition, over 120 community-driven, independently organized Mini Maker Faires are now being produced around the United States and the world—including right here in Charlotte.